The ABS light is one of the most common dash lights to come on at higher mileage, closely followed by the dreaded Check Engine light. Dealerships know that they can’t sell a car with either of them illuminated. Owners know that getting them turned off usually means big money, or some quality time in the garage. 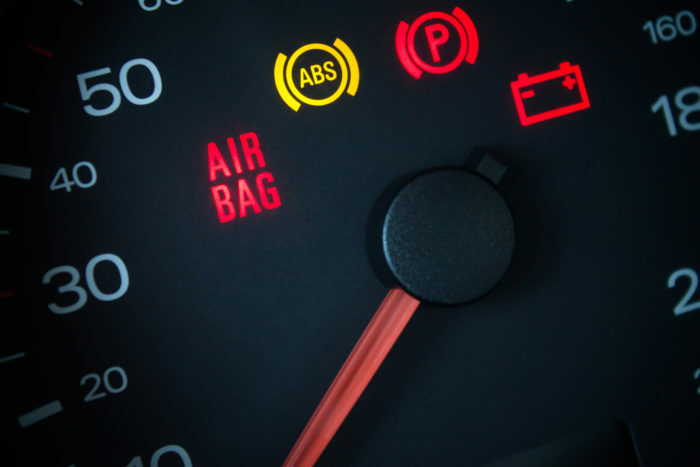 Here are three starting-points for ABS light diagnosis that will guide you in the right direction to finding the problem and fixing it right the first time. Cars are meant to be driven, and this means four-season operation for many owners. Road hazards like ice chunks, rocks, and construction debris will enter a vehicle’s wheel well at least a few times a year, and the ABS sensor wire is the most fragile item in this area. Look for slices in the ABS sensor’s jacket or bright bare copper exposed along the wire when inspecting the system. A wheel bearing isn’t often considered an ABS component, but it directly involves it and if failed, will throw the system into error mode. If a wheel bearing is significantly worn to the point where the wheel can wobble about its axis, more than likely an ABS speed sensor code will be stored. Why? Tone rings (or reluctor rings depending on the vehicle) are often mounted to the axle shaft of front-wheel and all-wheel drive vehicles. If the wheel speed sensor is mounted on the vehicle’s hub, it is spaced a specific distance away from the spinning ring on the axle. When the wheel bearing has failed catastrophically, the axle and therefore the ring will wobble around, altering this specification and causing the speed sensor to exhibit brief periods of no signal. In extreme cases, the axle can come in contact with the wheel speed sensor, effectively damaging it beyond usability. The ABS module is the main brain of the ABS system. It receives speed signals from each ABS sensor, knows when the brake pedal is depressed, and can modulate the brake pressure at all four wheels individually in a panic stop. With this clever ability comes a bit of complexity. The circuit board in an ABS module is jam packed with components and pins from each of the sensor inputs. Extreme heat and cold in a vehicle’s engine bay expands and contracts the internals of the ABS module, sometimes causing vital electronic solder joints to crack and become disconnected. If the entire ABS system looks good, but there’s a bad wheel speed sensor or ABS pump fault code, consider the ABS module. An ABS system can enter fault mode for a multitude of reasons, most including loss of signal or a vehicle’s mechanical failure. By knowing what components are involved in an ABS failure, diagnosis will be easier and less costly. Learn, study, and get hands-on with your car’s ABS components if you’re into DIY maintenance – most vehicles have easy to maintain ABS parts allowing you to keep the car at home and out of the shop.